The year 2007 was the time when the consumer cloud storage space was heading towards the phase of post-nascent maturity with the emerging of the heavy-weights like Amazon’s Web Service (AWS), Dropbox and MediaFire. Realizing the potential, Microsoft decided to hop onto the ship that is going to reach over 88 billion American dollars by 2022. OneDrive, which was initially known as Windows Live Folders at the time (codename SkyDrive), was launched in the United States for a closed testing group. Later that year, the test group included users from the UK and India as the program was extended to 22 countries. In 2008, the legacy users (individual accounts) of OneDrive were upgraded from 5 GB to 25 GB of storage. 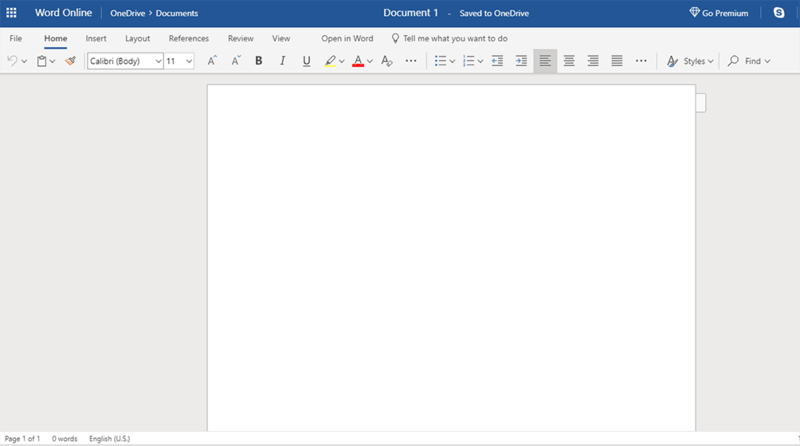 Over 4 years before Google Drive brought the integration of word processing tools with cloud as a norm, OneDrive took the first plunge and integrated their Office Web Apps (now Office Online) with their cloud storage. The two turning points in the history of OneDrive are the adaptation of HTML5 in building their web-interface and the release of Windows and MacOS apps of the drive. The adoption of the HTML5 enhanced the user experience to another level and exceeded the expectations of many industry experts. Microsoft bundled OneDrive starting with Windows 8. This helped push the acceptance and usage of OneDrive amongst the juggernaut share of the renowned operating system. This is one of the most requested features for the OneDrive on the web. 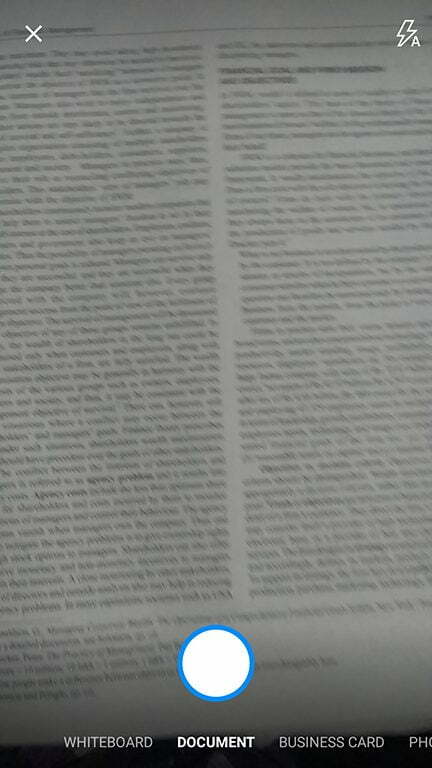 Oftentimes, there comes a need to compare the changes in a file for the analysis of the data. File versioning allows the user to download/restore an older, different version of a file for up to 30 days. Dropbox and Google Drive have had this feature for over 5 years before OneDrive introduced it to their cloud, upon user request. Unlike Google Drive and Dropbox, the files deleted by the user end in the trash bin (Recycle Bin) without using the user’s allocated space. The files are deleted from the Recycle Bin after 90 days. Users can restore the files within this time-frame. Around the same time when Google Drive was getting an overhauled integration with Google Chrome, Microsoft added the capability in the “wave 4” of their update to add Office Online to their cloud storage. This allows users to use the renowned Microsoft Office apps like Word, Excel, PowerPoint, and OneNote. The functionalities are virtually identical to those that were initially offered on their desktop version. The online Office offers the option to juggle between the desktop and online version if you are feeling bored and monotonous using only the online version. 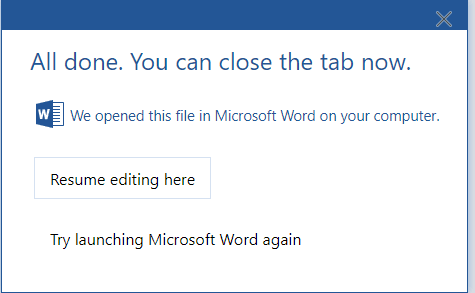 The Microsoft office package needs to be installed for switching between the two platforms. Free users who do not want to make their wallet lighter for extra cloud storage can benefit from the referral program. Users can refer their friends, colleagues, etc. to sign up for OneDrive. For each user who signs up through a referral link, you earn 0.5 GB of extra storage space. The limit of referrals is 10 per account. Other major cloud storage offering extra free space are Dropbox and Sync.com. Windows 8 and above users get OneDrive pre-installed in most Windows versions across different regions. If it is not pre-installed, users can head over to the download page and download the app for different platforms. OneDrive is accessible from the taskbar icon. A left-click on the icon opens a menu with the recent activity of the cloud. The bottom part of the pop-up menu has an open folder button that takes the user to the OneDrive folder that opens in the Windows explorer based window. It contains all the files and folders present in the cloud. 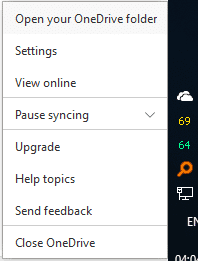 Double clicking on the taskbar icon also opens up the OneDrive folder. Files and folder uploaded from the desktop also appear here. 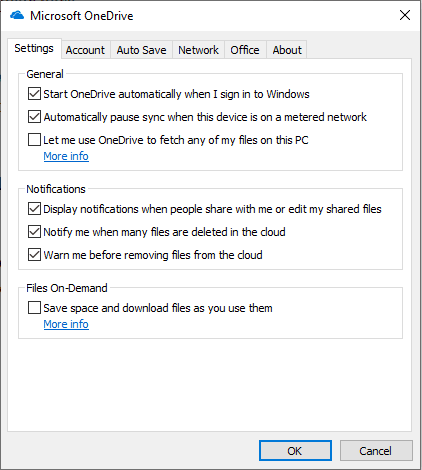 Right click on any file and click on the move to the OneDrive option. The file will be moved to the drive folder which is present on the desktop. Click on the more button of the popup menu and select pause syncing. The pause can set to 2 hours, 8 hours or 24 hours. The pause of sync will stop all the activities that OneDrive does in real time, for instance, uploading, downloading, metadata synchronization, etc. The settings of the cloud and desktop application can be accessed from the taskbar icon with a right click. The settings tab of the preferences has options like starting OneDrive along with the Windows login and a variety of notification features for various cloud activities. Another beneficial feature to save space or data on a metered Internet connection is the File-on-demand. When the user enables this feature, the list of their files appears in a view-only list. Opening any of them downloads the file instantly. A stable-speed Internet is recommended for taking full advantage of this feature. The next tab is the Account one and has two sections. The first one is for adding more OneDrive accounts to the PC, upgrading storage plans, and unlinking the PC. Unlinking a PC de-authorizes the personal computer from the trusted devices list of OneDrive for the signed-in account. Right next to Account is the Auto Save tab which deals with the auto-synchronization of files and folders along with photos, video, and screenshots. The next time you connect a camera, phone or a device with videos and photos, OneDrive has the feature to automatically upload them to the cloud. Screenshots can be uploaded automatically without the need to tag the folders for screenshots. Pressing the Print Screen key on the keyboard launches the save to OneDrive one-time feature setup to upload the screenshots taken on the personal computer and then store them in the cloud. The Network tab has the functionality to limit the download and upload rate of cloud synchronization. 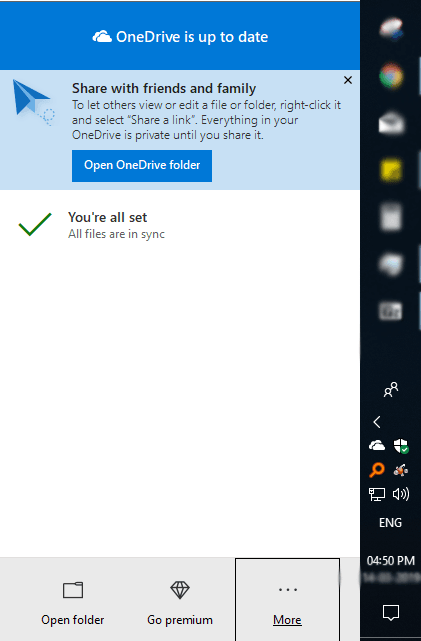 The competitors of OneDrive like Sync.com and SpiderOak One offer data limits as well. It’s a tiny yet crucial feature for users on a metered connection. You can always post on their feedback forum demanding the inclusion of this functionality. Last but not least, the Office tab offers syncing and real-time simultaneous/parallel working on a file with Office. What it does is that it syncs the documents and files created by the desktop Office suite with Office online. Any invited user can access and do collaborative work on the same set of files/documents. The sharing option for files and folders is an easy two-click and the links get copied to the click board, meaning you can paste it directly without the need to copy it. What we found to be lacking is the lack of privacy in terms of sharing files like a password or perhaps an email authentication access for free users. Advanced link sharing features are available on the web-interface only. The web version of OneDrive has a sleek and minimal interface. The function buttons are situated on the top part of the page unlike Google Drive and Dropbox who have a de-concentration of buttons, eventually distributed across the page. This is an individual preference for the user-interface design and may vary from user to user. The Search functionality can be accessed from the top left corner of the page. The Search function scans the content of a file, type of file and exact match-cases. This feature is not as extensive as the one Google Drive offers. Partial credit to Google’s search-engine prowess in relying on AI-based algorithms for identifying photos and files. The overall placement of the function buttons is pretty standard with a leftward menu, which is not collapsible by default. Displays with smaller resolutions have the leftward menu hidden with an option to show it via the hamburger icon. The leftward menu has access to files, recently accessed files/folders, photos, PCs, shared folders/files, and a recycle bin. Photos come along with tags for adding metadata to the files. This enhances the search results for photos by providing extra information to the otherwise single-dimensional search feature. 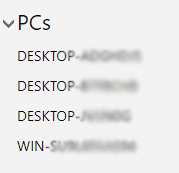 The PCs section shows the list of devices where the OneDrive desktop is installed. Users can remove PCs as well as view the files/folders synced from a particular one. This feature did not function properly for us even after numerous tries. The gear icon on the top bar takes you to the options. There, you can find the Office File Formats section, which provides the option to choose between standard office extensions (.docx, .pptx, .xlsx) or OpenDocument format extensions (.odt, .odp, .ods). This works for the Office documents that are created using Office online. OneDrive offers the most straightforward app amongst the big players. The mobile app has a minimalist-inspired UI experience. Everything is right there on the screen without the need to swipe anything up or down. The quick-access options are present at the bottom of the screen. The arrangement of files can be a block of semi-thumbnail tiles or in a list. Files and folders can be arranged alphabetically, by age, size or extension. Tapping the blue circular camera icon at the bottom opens the camera for scanning. The app has different modes for scanning whiteboards, business cards, documents, and photo paper. While the scan diagonals-assist feature is a nice added touch that their major competitors do not currently have to offer, the limitation on converting the scanned objects and documents into a pdf for free users is a bit of a letdown. Editing of documents requires the installation of office tools like Word, Excel, PowerPoint, etc. just like Google Drive. OneDrive mobile application has an extra layer of authentication security offering a 4-digit passcode and fingerprint scanning to verify authentication. Free users can save files for offline access while entire folder-based access requires upgrading to premium plans. Users can access all the offline access files from the Me section apart from the general browsing and searching method. 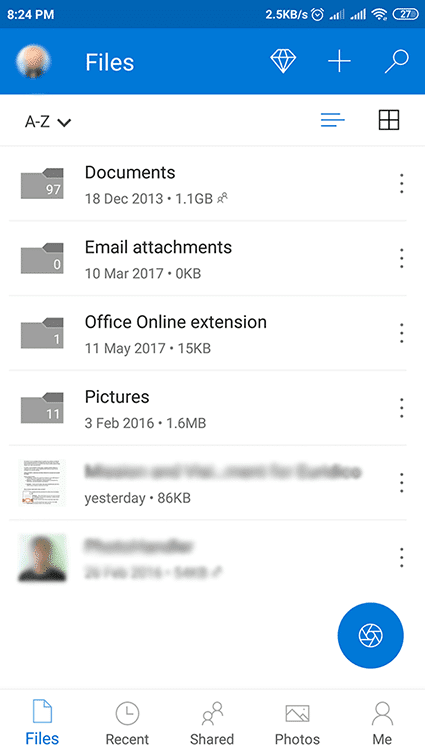 All the photos and videos on mobile storage can be synced and uploaded to the OneDrive by enabling the option from the Photos section. Microsoft has been on the receiving end of criticism for monitoring cloud storage to track spam and unsolicited data. OneDrive offers 2-FA (Two Factor) for users to safeguard authentication to their account. The second factor can be via a call, message or mobile push notification on the Microsoft authenticator app. Whenever a user attempts to login into an account from untrusted devices, a security code is sent to the user as an email, SMS or mobile authenticator. The user needs to enter the code for successfully logging into the account. The backend security comprises of TLS (Transport Layer Security) for data in transit. Each file is encrypted with an AES256 key. These keys are further encrypted with a combination set of master keys that are stored in the Azure Key Vault. Furthermore, Windows Defender engine actively scans the files and documents when they are being downloaded to the PC. The Windows Defender antivirus definitions are updated on an hourly basis. Users can further increase the security of their data by using BitLocker or 7-zip’s AES-128 encryption for local-client side data protection. What we found to be lacking in this virtually adequate protection suite is the absence of a password authentication for accessing the OneDrive. Logging into the account acts as the first line of defense, however, leaving the computer unattended for a few minutes without logging off can attract intruders who pry for such opportunities. 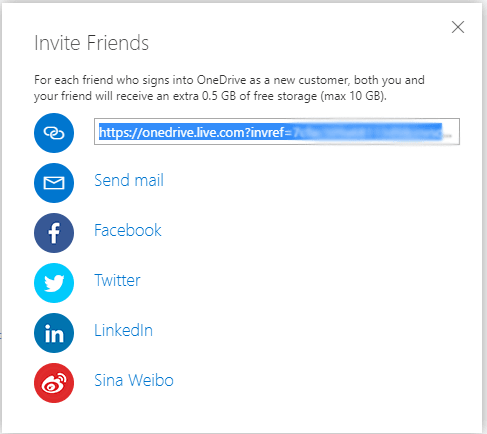 Let us start about the user-friendliness of the program with the web-panel interface, OneDrive on the web. While the overall usability of the interface is on the easier side of the operational difficulty barometer, the settings section feels bogged down with endless loops with no navigation buttons. Although the browser buttons do help to browse through the settings, a clear breadcrumb-inspired hierarchy would have upped the navigation game. On the other hand, the user interface of the mobile application is minimal without any kind of clutter. All the options offered are on the screen and one might even say that it is simpler than Google Drive without cutting down on functionalities. The passcode and fingerprint authentication are the added icing to the cake. The desktop application is easy to use and has an interactive UI to get things done. It is said to be inspired by minimalism for enhancing the user experience. 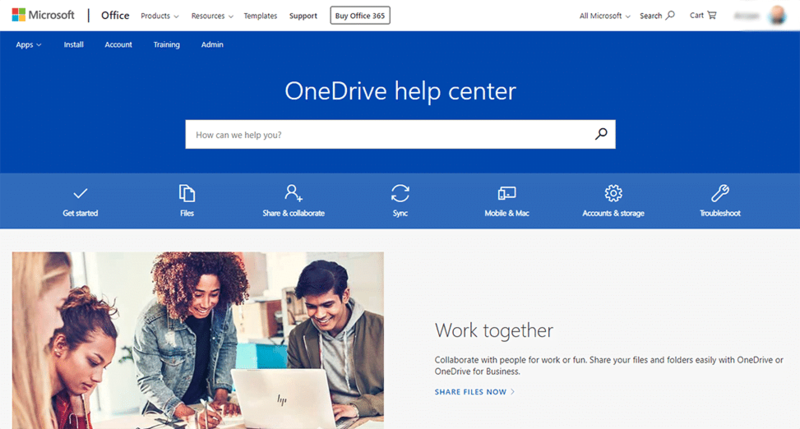 OneDrive has an extensive knowledge base along with a support forum of Microsoft for getting resolution for your queries and problems from other users and power users. The forum is moderated by community gurus and designated moderators. 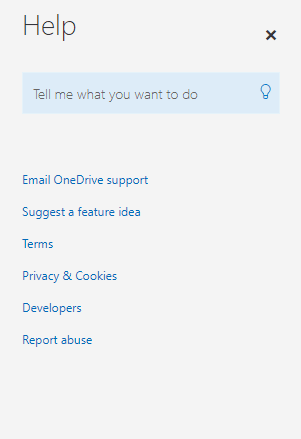 In case the knowledge base or support feels to be inadequate for your query, you can email them right from the web-panel of OneDrive by clicking on the QUESTION MARK button on the top bar of the page. Real-time chat is also available via a chatbot, which connects to a support representative. Expirable links – The links shared with others for sharing files and folders expire automatically after a specific period of time. This way, data is secured and it helps in avoiding intrusion by third parties as the access is open only for a limited period of time. Password protected sharing – The files and folders shared with other users can contain a password for authentication verification while trying to access them. No more unsolicited access to the data. 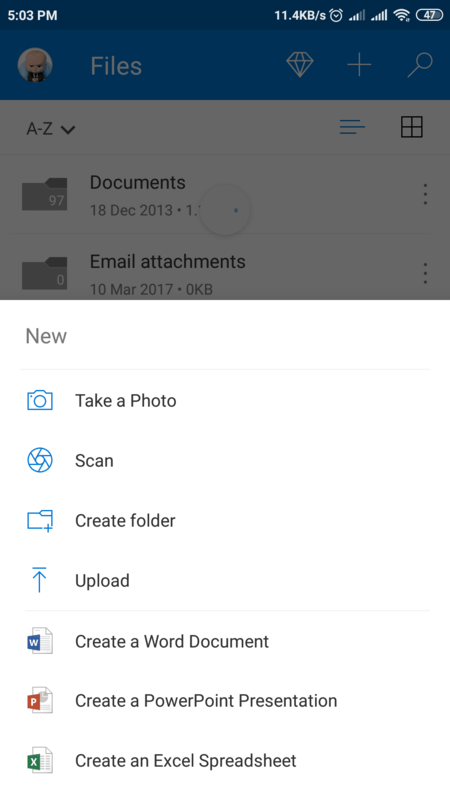 Multi-page scan – The mobile application can scan multiple document pages and combine them into a single document in the shareable form of a PDF. Increased sharing limit – The limits of free users on sharing files and folders are removed for premium users. Free subscription of Microsoft Office for PC + Mac – Full-fledged access to Microsoft Office for PC and Mac users along with Office Online. While being a big success in the enterprise storage services in recent years, they have been a late entrant to the public cloud storage market. 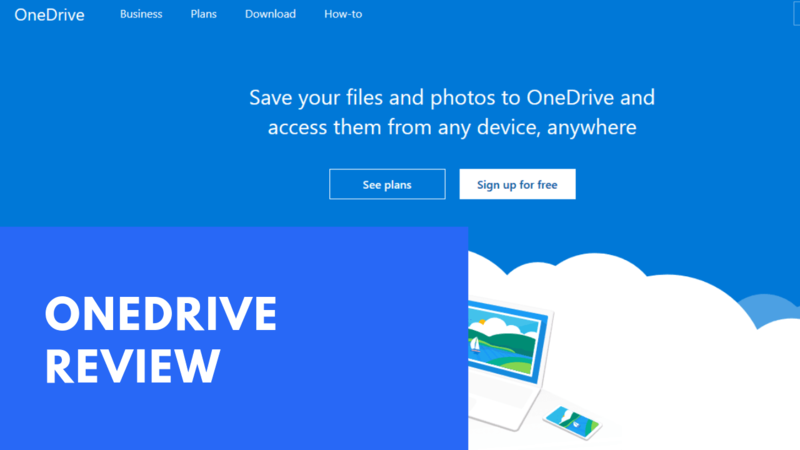 OneDrive has had a pretty good acceptance amongst users for various reasons like bundling with Microsoft Windows as well as the introductory offers which offer premium features to free users. UserNote, a feedback and suggestion platform for Microsoft services, has helped the developers of OneDrive understand the users and the market better than some of their competitors.